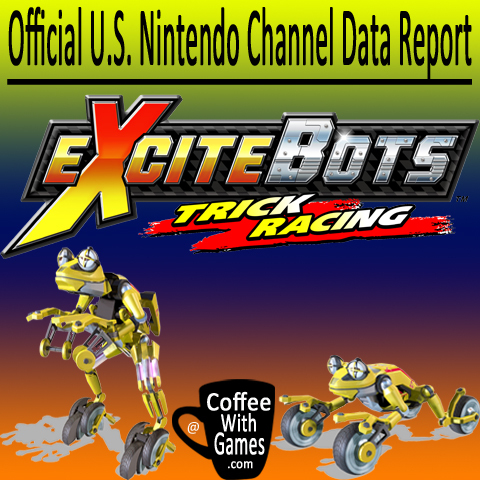 Coffee With Games: ExciteBots: Trick Racing! Hours spent playing the Wii's most bizarre racer! Official U.S. Nintendo Channel data report. ExciteBots: Trick Racing! Hours spent playing the Wii's most bizarre racer! Official U.S. Nintendo Channel data report. 40+ races, 19 ExciteBots to customize/unlock, local and online multiplayer. How was ExciteBots received by critics and customers? The game currently has a "professional" review score average of 80.19%, based on 27 reviews from GameRankings.com. The current customer review score average is 87.77%, based on 54 reviews for both SKUs of the the game on Amazon.com. Overall, positive reviews from critics and customers that played the game. First, let me answer the second question (okay, really like fourth question) from above. 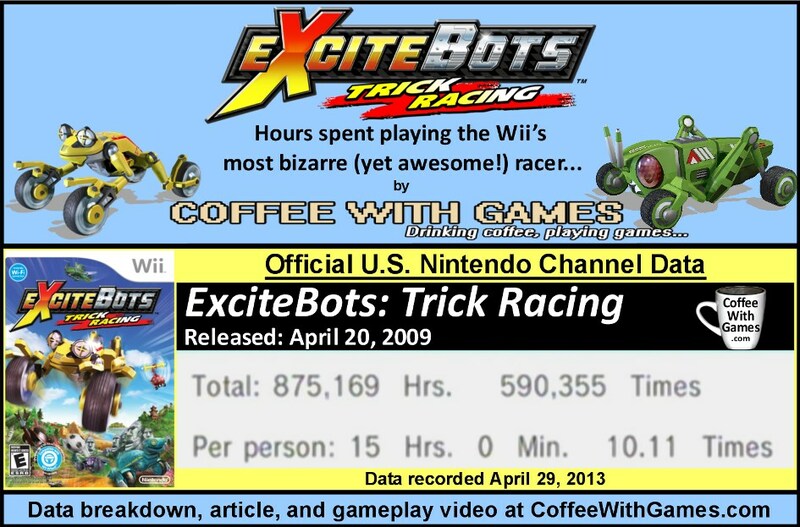 If you own a Wii, or even a Wii U, is ExciteBots: Trick Racing a game you should look at buying? YES! If you enjoy arcade racing type games that have a great sense of speed, I highly recommend you give ExciteBots a try. The game can be found for under $20 new, and under $10 used. (Only $5 used HERE, at GameStop!) Now, if you're a Wii U owner interested in the game, you just need to make sure that you own a Wii Remote as well, because Wii games can't currently be played with the Wii U GamePad. As for my reported game-play time with ExciteBots, the image above shows my reported time with the game as it appears on the Nintendo Channel. So, I have just over three times the number of hours played, as the reported average "Per person". Again, if you can grab the game now for under $10 used (I doubt Nintendo is still publishing it), I would highly recommend that you do so. You should easily be able to get around 10 hours of game-play from it just enjoying the single-player racing campaign on your own, without even playing local or online multiplayer or the mini-games in it. You can purchase some of the games developed by Monster Games for Nintendo platforms linked below! 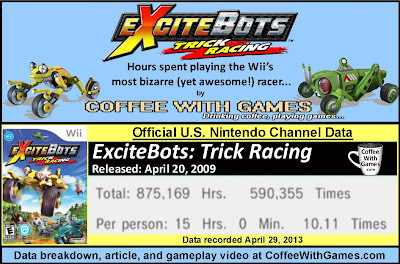 Oh man, Excitebots is far and away my favorite racing title and probably my favorite Wii game as well! I'd spend my days off JUST playing this game over and over, hoping for the elusive S rank. I think it might have been the only game in my Wii for about 5 weeks or so. Throw in the online, challenge mode, and poker races and I was glued to my tv. I bought Excitetruck later and was disappointed. It's not a bad game, actually it's a fine little racing title... but Excitebots just blows it away. When I wanted to improve my performance on Mario Kart I'd pop in Excitebots for practice since it's much faster and much crazier. I'd love to see a sequel to Bots, but we'll probably see another iteration of Truck. World Rally was a lot of fun too, but no local multiplayer kinda hurt it for me. "When I wanted to improve my performance on Mario Kart I'd pop in Excitebots for practice since it's much faster and much crazier." As a Mario Kart Wii owner, I agree. I played ExciteBots first, then Mario Kart Wii. The sense of speed is done so much better in ExciteBots. Going from the one game, to the next, really shows how SLOW Mario Kart feels. I actually had a draft around here about that issue, but never published it. I played... Excitebikes a million years ago (and not toooo long ago picked up the 3D remake of it for the 3DS as a freebie). Still haven't gotten around to playing this, which is a shame because I've heard so many good things about it. Even if racing titles aren't my favorite as a rule, this has always looked fun. "It is so crazy, zany, and weird that I can't help but like it :D"
Sounds like a good ad could have been. "Do you know your uncle? The one that is crazy, zany, and weird...but you can't help love him? He's just like ExciteBots!" I'm trying to remember if we ever played online together now...I can't remember! I played Excitebikes on the NES when I was little, actually remember the friend's house I played it at. We didn't own it, but I enjoyed the track editor at the time. I'm really not surprised your office doesn't have this though, as Nintendo didn't seem to market it that well, which is really unfortunate. Time? What's that? Actually, being that you would be playing it on the Wii U via Wii Mode, I'm kind of interested to see if there would be any issues (I wouldn't expect any, but I haven't tried it). I'd have to consult you here. That is possibly not one thing I usually do!